Before implementing a project, you will want to get to know the community you will be working with. Community assessment empowers people by giving them a voice in the process. This will ultimately lead to higher impact, longer lasting change in the community and will provide an equally satisfying experience for your club or district. 1. Identify club goals. Knowing what your club finds important will help you identify projects your members will be excited to undertake. The best projects come about when club goals align with opportunities in a community. To accomplish this, panelist Tonya Gamble says her club went through a five year visioning process to determine “two things—that [we] wanted to work with youth and wanted to do something that the community really needed.” This led them to build the first playground in their community that was 100% inclusive. 2. Remember, you are most likely an outsider. Although your club may be working on a local project, you may still be viewed as an outsider to the beneficiary community for various reasons. Keep an open mind as you approach a community and remember that you are there to learn. If you are planning to be the international partner on a global grant, work with the host Rotary club to assess the local community. 3. Get to know the community before beginning your assessment. Find out how the community likes to communicate: in small groups, through big, town hall discussions, or somewhere in between. Prepare open ended questions that allow community members to freely answer your questions. Assessments can be done formally and/or informally: decide what format your club members and members of the community are most comfortable with before you begin. 4. Ask and listen. Ask the community you are working in about their goals, strengths, needs and assets. Make sure to listen to their answers and avoid making any promises. Encourage the community when they answer your questions by telling them how informative and insightful their responses are. Identify some community members who can help to lead the project. Ready to talk to the community but don’t know where to start? Check out Rotary’s Community Assessment Tools publication for ideas. 5. Give all members of the community an equal voice. When going into a community, consider all of the stakeholders you will come in contact with and how you can work with them. Some members of the community may be illiterate. In some communities, women do not feel comfortable sharing their opinions in front of fellow male members. Children are often the most open, honest and reliable sources for information! Take time to speak with all community members and continually reiterate to them that their voice is important. 6. Focus on building capacity. Be careful not to fall into a trap of asking only, “What do you need?” Often times this will result in a list of materials. See if your club can assist in building the capacity of a community through skill building, professional training, or by creating new programming. 7. Don’t forget about existing community strengths. While every community has needs, communities also have assets and strengths. Identify a community’s assets, resources that can be used to improve the quality of community life, and strengths to emphasize what the community does have. Then determine whether these assets and strengths can be used to meet the community’s needs. Remember, assets can be people, locations, goods, organizations, networks, and more! Communities are often able to meet their own needs; all it takes is facilitating a discussion or bringing together different stakeholders. 8. Identify potential partners. When talking with the community, ask to see if any other trusted organizations are already working in the area. If the community feels these groups are doing good work, consider connecting with them to see if there are areas where you can partner to avoid duplicating efforts. 9. Think about sustainability (it’s not too early!) Although you are just in the planning stages of your project, it’s important to start thinking about how your project will impact the community in the long-term. Panelist Andre Brandmueller stresses obtaining the community’s buy-in as the first step to ensure sustainability. For example, Andre spoke with teachers in local schools to hear their needs and goals for their students to create a lot more excitement around the project before it even began! 10. Make plans for measurement and evaluation now! When setting your objectives for a project, make sure there are some concrete things that you can measure. Don’t make your objectives so broad that you won’t be able to identify success. If this is your first time measuring a project, keep your measurements simple by limiting them to things that can be counted. Begin thinking about how you will use the information collected from your project to assist you in making even better projects for the future. What worked? What didn’t work? How can this help us in the future? 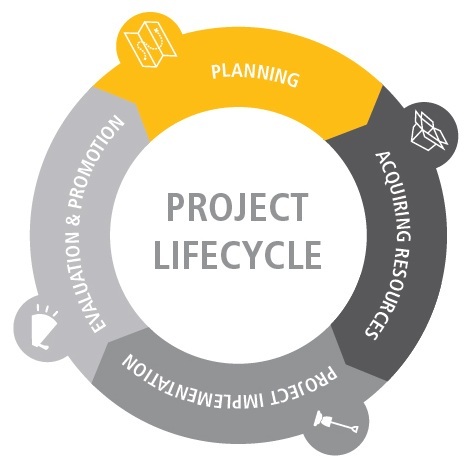 Visit My Rotary for additional project lifecycle resources.